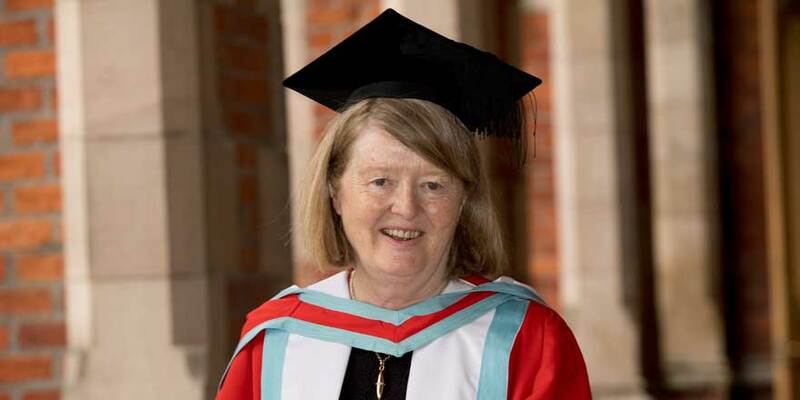 Mary E. Daly former President of the RIA was honoured on Tuesday 4 July 2017 for distinction in the humanities at QUB where she received an Honorary Degree. Professor Daly served as President of the Royal Irish Academy from 2014 to 2017. Previously, she held the roles of Secretary of the Royal Irish Academy and vice-chair of the Academy’s Working Group on Higher Education. Professor Daly is one of Ireland’s most prominent senior historians and is a member of the government’s Expert Advisory Group on Commemorations. Professor of History at University College Dublin, Mary E. Daly served for seven years as Principal of UCD College of Arts and Celtic Studies. She has also held visiting positions at Harvard and Boston College. She has served on the National Archives Advisory Council and the Irish Manuscripts Commission. Professor Daly was involved in the commemoration of the sesquicentenary of the great famine 1995-97, with Dr Margaret O’Callaghan she directed a research project on the Golden Jubilee of the 1916 Rising, resulting in the publication of a major edited work: 1916 in 1966: commemorating the Easter Rising (2007). Professor Daly also sits on the Mother and Baby Homes Commission of Investigation. Over the course of her distinguished career, Professor Daly has researched widely and published prolifically, notably: Dublin, the Deposed Capital: A Social and Economic History, 1860-1914 (1984); Women and Work in Ireland (1997); The Slow Failure: Population Decline and Independent Ireland, 1920-1973 (2006); and, with Theo Hoppen, Gladstone: Ireland and Beyond (2011); and Cambridge, Sixties Ireland: Reshaping the Economy, State and Society (2016). Congratulations to Neuroscientist Prof Eleanor Maguire Hon. MRIA who was among the 76 academics elected as Fellows of the British Academy today in recognition of her achievements. Graeme Watson, computational chemist was admitted to the Royal Irish Academy on 25 May 2018. Koen Verbruggen, Director of the Geological Survey of Ireland was admitted to the Royal Irish Academy on 25 May 2018.